"Enjoy capturing photos and videos with your camera or mobile phone? Now you can easily and quickly turn them in to awesome movies with your own special touches, then share them with friends. muvee Reveal Express is the perfect slideshow maker for those on-the-go videos you want to edit, upload and share in minutes. Importing photos and videos in any format makes life even easier! First, just select your photos and videos, then select a Style. We've included 3 Styles to choose from. Our Styles automatically add in the professional effects, transitions, text animations and all the fine subtle editing techniques that film experts use. Then, add a soundtrack whether it's a song or a few fav songs (or even just your favorite chorus thanks to the music trimming feature). Then Play and Save! In a few clicks, bring your photos and videos to life. muvee Reveal Express comes complete with professional effects, transitions, great looking Titles, Credits, and Captions. Be the star in seconds by uploading your movies to YouTube and Facebook in a click, or just share with your inner circle of BFFs on muvee Cloud, your personal sharing space just for muvee users. 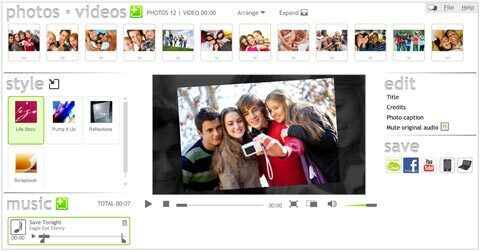 muvee Reveal Express slideshow maker will even automatically prepare the final video file to share on your Android or iPhone! Product features include...Upload, edit and share in minutes Choose the soundtrack whether it be a song or a few songs Three awesome Styles includedProfessional effects, transitions, Titles, Credits, and CaptionsUpload to Facebook and YouTube in a click; save to your Android or iPhone"